We've got 3 copies of the book to give away to our members! I have been designing and making bears and other animals for many years and have a lovely studio where they are all made, in Paisley. I live in Kilbarchan a small village in the west of Scotland with husband and noisy cat. Over the years, I have written books, designed kits, travelled to Japan and US with my work. My animals can be seen in some top retailers but I mostly prefer to sell direct to collectors. 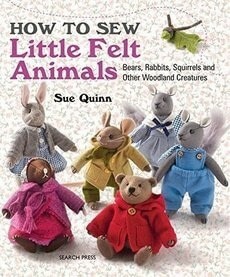 The projects in the book are an adorable group of little animals approximately 6" high together with their clothes. The instructions are easy to follow and well laid out - Search Press certainly do a lovely job with their books! 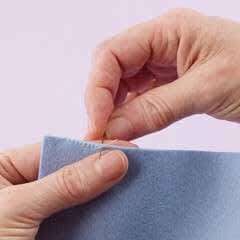 My first love was for pure wool felt fabric, and this is what I used on my very first designs 50 years ago!! Felt has made a wonderful comeback and there are great colours available. I just love the texture and bold colours of this fabric and it can even be dyed. I thought it was time to share some more of my work this way. Although the designs are a little more complex and fiddly, they look great when they are finished. I love mice! I think the mouse has a great expression and the little coat suits him well. I am very lucky - I have studio premises where I work every day to make the animals that I sell. At home in Kilbarchan I also have a little art room where I can work into the evening if I want (under the supervision of my cat!) This is a great room with lots and lots of drawers to store every type of craft item you can imagine although sometimes it is hard to keep it tidy! Finally, I do my writing in the study at my trusty PC. Ever since I was a toddler I have been creative - much to the frustration of my poor Mum who had to follow me around tidying up! At the age of eight I designed and made my first teddy bear using a piece cut out of my candlewick bedspread. Lumpy and strange looking it had a certain 'appeal'. At the age of eight I designed and made my first teddy bear using a piece cut out of my candlewick bedspread. Lumpy and strange looking it had a certain 'appeal'. It was when I was 14 that I really started in earnest and I designed and made a small range of felt animals including a mouse called Timothy which I still have! I love books and have a collection in my bookcase but I am struggling to quote a favourite - I love them all! I love looking around antique fairs and I like the nostalgia feel. I suppose my own childhood gives me a lot of inspiration. There are wonderful sites online but I have always used my own ideas and imagination. I am dreaming up new characters and situations all the time and I like to sketch these little scenes too. I am working on my next book for Search Press which is really exciting as they are great to work with! 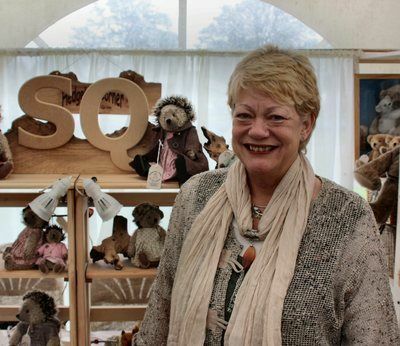 For over thirty years Sue Quinn has designed gorgeous little felt animals that appeal to both adult collectors and children. 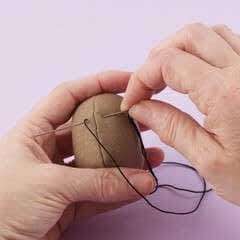 Now she would like to share her 'master secrets' so you can use machine or hand sewing to create these endearing, beautiful little creatures that you will want to make and keep. Colorful, strong and easy to use, felt is the perfect material to make this collection of charming classic woodland animals. Follow the clear step-by-step instructions to create a group of endearing little creatures that you will want to make and keep.